Just picked up two of these Silent-Master Interlocking Heavy-Duty Dolly (330 Lbs. Max) (Amazon link) at Costco. I've locked them together ad put my brewng setup on them. I can move the whole 16 gal system around with one finger on the concrete floor of my garage. I just wheel it out the door and unload it on brew day. Makes reorganizing the brew garage much easier while I'm in my cleaning phase. I have a homemade one as well. 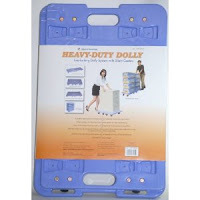 Actually a furniture dolly might work as well and be less expensive. After a near disaster moving a carboy from my brewing area to my bedroom, that has a constant temp all day, I picked up the exact same dolly at Costco. Aside from losing 5 gallons of ale, the real disaster would be facing my wife if 5 gallons of sticky wort and glass suddenly showed up on our master bedroom carpet. The dolly was cheap (under $20 if I remember correctly) and works great for transporting a single carboy at a time. 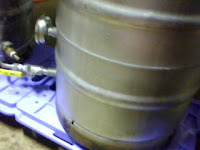 I no longer worry about carboy breakage in transit, and my back is also much happier after a day of brewing.